After a great Monday on Mt Hood, where to go next? North Sister seemed like a good objective, since I hadn't skied much of anything worthwhile on it yet, just a couple of times on its lower flanks. Although North Sister has a rocky 10085 ft summit pinnacle which is likely unskiable, two of its glaciers hold fine steep (45+ degree) ski routes which top out a few hundred feet below the summit: Villard Glacier (and the associated Early Morning Couloir) on the northeast, and Thayer Glacier and its headwall on the east. Both had been on my agenda for at least a half-dozen years, but circumstances (and lots of other ski trips to do) had never allowed me to hit them. But would either route be in condition now? Rockfall is a serious concern on both routes, so I had to take a look before attempting them. I got a distant northeastern view of the Three Sisters including the Villard from Hwy 126 at sunset, but I needed more. Sunrise view of North and Middle Sisters, from Hwy 242 just west of Sisters, OR. Villard Glacier at right, with Early Morning Couloir aiming for the summit pinnacles. I spent the night at a campground just outside Sisters, OR, and left at sunrise to drive to some viewpoints. 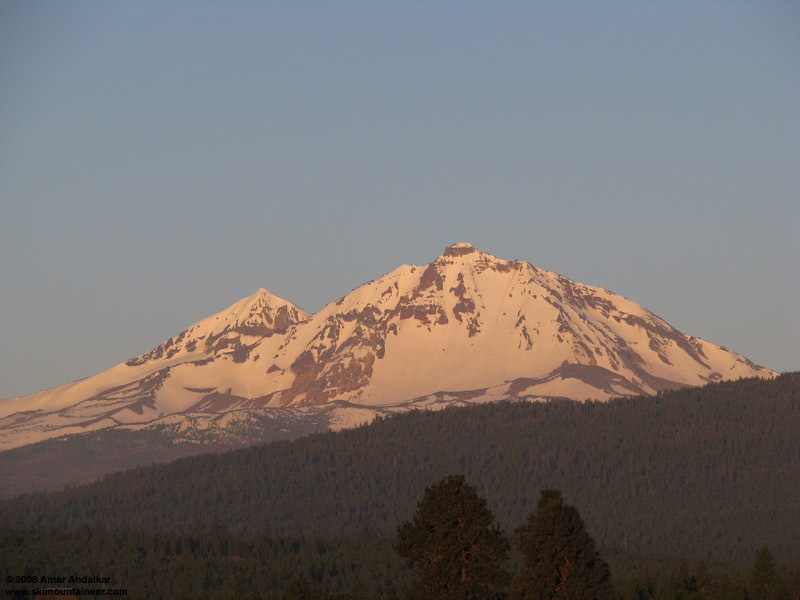 There's an excellent view of the NE side of the Three Sisters (and N side of Broken Top) from Hwy 242 just west of Sisters, and a fine view from the ENE (including Thayer Glacier) from the designated viewpoint on US 20 about 10 miles SE of Sisters. Well, the Villard looked good, other than a single streak of rockfall down the middle which could be avoided by going right, or up the even steeper Early Morning Couloir. The Thayer Glacier was not so good, streaked by lots of rockfall below the hourglass at the top of the glacier where it meets the headwall, which looked very clean in contrast. So the Villard it would be. Thayer Glacier and Headwall at left. Started from Pole Creek trailhead at 8:15am, much later than planned and really unsure how it got so late given that I was up and driving at sunrise nearly 3 hours earlier. I guess taking route photos just eats up lots of time. The first snow patch was at 5400 ft only 5 minutes from the car, and snow coverage exceeded 50% by 5800 ft, but it was never reasonable to skin. So I kept hiking in ski boots 1.5 miles to the junction of the Green Lakes Trail, and then headed west off-trail, following the mostly bare ridge up to 6200 ft before dropping a bit off its left side into the well-snowcovered Soap Creek drainage. Skinned from 6150 ft, on well-consolidated snow with minimal ski penetration, and made sure to take the North Fork of Soap Creek, to end up at Villard Glacier instead of Thayer. This is the prettiest side of North Sister, and as I reached treeline in a broad basin above 7000 ft, the views opened up magnificently. North Sister from the basin below Villard Glacier. Unfortunately, as I skinned higher up the face and onto the glacier, the snow become less and less consolidated (it is unclear how far the glacier actually extends, since no crevasses or other features are visible now). On this NE aspect, the recent snow from earlier in June had not gotten enough sun to bake down into summer form. Soon, ski penetration was 4-6" and a ski pole basket easily went in 1-2 ft in spots. A pair of climbers had turned around just after 10am, it looked like they had reached maybe 8500 ft, and as I skinned up past them during their descent they reported deep mushy snow. As the slope steepened past 30 and close to 40 degrees, it was clear that this was not the right day for this route. I took a single angling skin track with no switchbacks all the way across the face and up to 8300 ft near the NE ridge. I could see a set of old boot tracks ascending from that point up the rightmost part of the face, but it was clear that I'd be postholing over knee-deep even if I tried to follow those tracks. And in any case, the skiing would probably be poor quality and potentially hazardous. So time to pull the plug. Mt Hood extending in a line northward, with Black Crater at right. I skied down just after 11:30am, and surprisingly the snow skied OK going straight down the fall line for 500 vert, not too mushy and not unstable. Then I took a long mushy descending traverse heading right (SE) across the face, aiming for a gap near 7400 ft just below a large rock tower, which would allow me to connect over to the Thayer Glacier side. If I wasn't going to get a long steep ski run, I might as well get some sightseeing in. and Thayer Glaciers, with Broken Top in the distance. I skied down through the gap, and traversed right some more near 7300 ft before donning the skins and aiming for the prominent notch in the huge terminal moraine of the Thayer Glacier. This moraine is well over 200 ft high on the downhill side, and exceeds 100 ft on the uphill side, damming a small lake a few hundred feet in diameter at 7623 ft. I skinned up through the gap and was awed by the spectacle of the Thayer Glacier's cirque, an amazing amphitheater with multicolored lava flows forming its walls. The shrunken glacier occupies the back of the cirque behind the lake, liberally strewn with fallen rocks and avalanche debris on its roughly 1000 ft high slope, with a snow bridge crossing the bergschrund at the top and leading to a narrow snow couloir slicing through rocks to reach the Thayer Glacier Headwall. 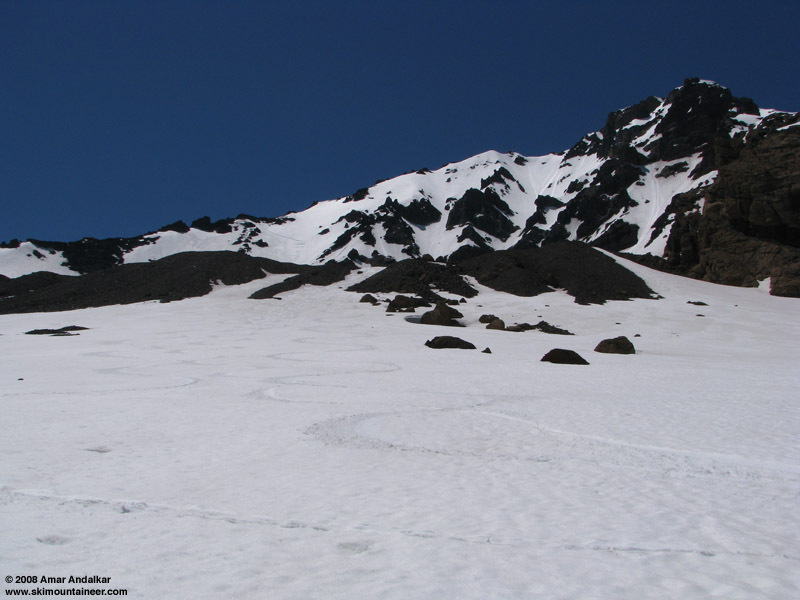 A large recent slab avalanche had run down the left side of the cirque walls, forming a massive two-lobed deposit on the SW shore of the frozen and snowcovered lake. Thayer Glacier and avalanche deposit. Ate lunch on the moraine and then decided to ski around the lake, just to take in the awesome spectacle which surrounded me. I skinned around the south end, past the toe of the avy deposit, and then took an angling ascent up to 8000 ft, which seemed to be about the last semi-safe spot not likely to be bombarded by rocks at any moment. But not very safe. I quickly switched over at 1:45pm, skied a short 350 vert of mushy dirty snow down towards the lake before angling left around its north end to reach the entrance gap in the moraine once again. Another group of skiers had reached that gap while I was wandering around the cirque, they must have wondered what I was doing skiing around the lake and onto such a rockfall/avy strewn slope, but they had already skied down before I got back. with the frozen lake below. I skied down the grey ash-strewn snow of the gap and then found corn! Not a lot and a bit too soft, but corn nonetheless and I enjoyed about 500 vert of it down onto the big open flats near 7000 ft. Then lots of mushies as I followed Soap Creek out through another, much-older set of moraines and down its narrow gully. I skied past where I had started skinning up, and eventually made it down to about 5900 ft, by skiing across a bunch of patches of bare ground and also having a few interesting moments on steep snow slopes above the rushing creek (snow still firm down here). Time to put the skis on the pack, and since I'd brought and used a GPS, it was quite easy to take a direct line back through the woods to intersect the trail. A quick 2+ mile hike brought me back to the car by 3:45pm. Ski tracks in the nice corn below the Thayer Glacier moraine. 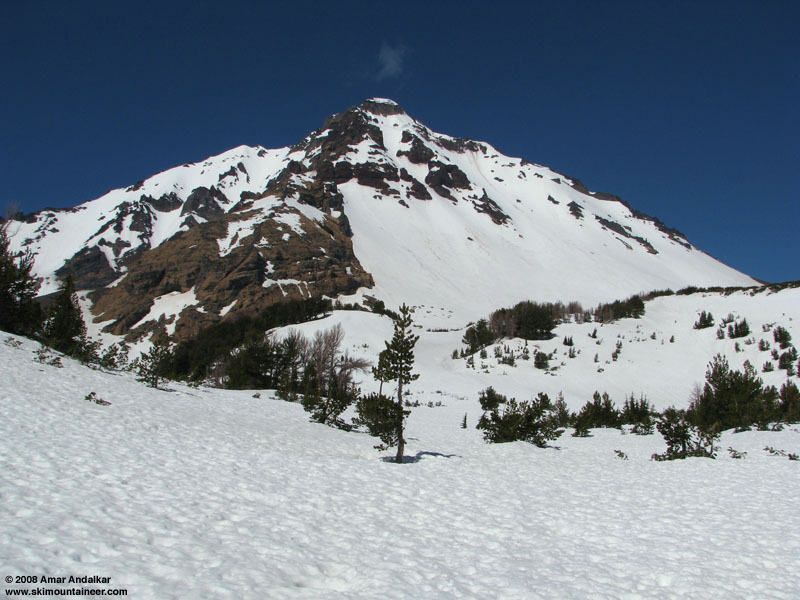 Well, the trip was a failure in terms of getting any quality steep skiing, but I did get to ski a little bit on two more of Oregon's quickly shrinking glaciers. I think there are only 35 named glaciers in the state, plus a handful of other unnamed but still barely-surviving remnants, and roughly another handful that have vanished entirely since photos of them were taken in the late 19th or early 20th century. The GPS showed 11.7 miles and 4300 vertical for the day, with about 3500 of ski descent. It was my sixth straight day of skiing since Thursday's trip to Muir, with just over 29000 ft of total ascent and 28000 vertical of ski descent over that time. Awesome! way to kill it Amar! Thanks again for the report since Eric and I are headed down there next week. I know what you mean about the photos eating time! Where you going next? not sure if you're the same JD on TAY that my buddy kevin and i met on rainier last june or not, but live in bend and if you're down for skiing next weekend and need an extra partner let me know. have fri/sat/sun off. Those "glaciers" are "remnant--sp?" at best on Villard/ Thayer side of the mountain. Some years they are virtually gone (if not gone...). A good 'creep and glide' "shrund" often forms on the upper Villard (which is an awsome route, comparable to Early Morning couloir in quality..) One can avoid considerable rock fall potential on the ascent by climbing the central rib between Early Morning Couloir and Villard as all the rockfall off of the false summit (Glissen Peak?) goes down either (in general...). EARLY is the best bet this time of year and don't linger too long under those cliffs of rubble... If you are climbing Glissen Pk--don't depend on any hand-hold...I have never had a non portable one (but it does provide a quick way to the summit!!!!!!!). BTW-- the Central Rib can be a really cool run with mininal objective danger from rock fall (relatively speaking...) with good steeps 'to boot'!